It has been confirmed that ten persons dead and many injured over a petrol tanker explosion in Amawbia, Awka, Anambra State. The inferno which engulfed many vehicles and shops in the area at about 8:30 pm on Saturday led to the destruction of properties worth millions of naira. The Police Public Relations Officer in the State, SP Haruna Mohammed, who confirmed the news to newsmen. 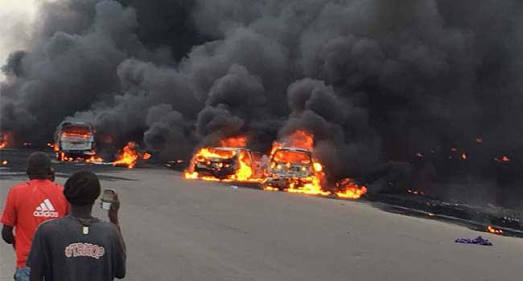 “As a result, the tanker was engulfed by fire which affected many vehicles and shops in the Area, thereby destroying properties worth millions of naira,” he stressed. Mr. Mohammed said Police Patrol teams and other Sister agencies mobilised to the scene, cordoned off the Area to prevent looters from taking advantage of the situation to loot and also contacted fire Service department in the state. Mr. Mohammed however noted that number of casualties cannot be ascertained at the moment as rescue operation was still on going. The PPRO maintained that the case was under investigation and effort was being intensified to get the truck driver arrested.